DAQ Modules are designed for temperature and voltage measurement. Multifunction USB DAQ modelsÂ OMB-DAQ-2408 and OMB-DAQ-2408-2AO feature up to 16 single ended (SE)/8 differential (DIFF) analog inputs. Each device includes 8 DIO and 2 counter inputs and features 24-bit resolution for accurate voltage or thermocouple measurements. 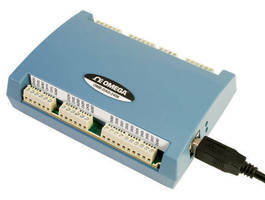 Model OMB-DAQ-2408-2AO also featuresÂ 2 analog outputs. Uses include measuring temperature and process signals in plant or lab environment for chemical, water, HVAC, and R&DÂ applications. Stamford, CT USA – Omega’s new 24-bit multifunction USB data acquisition models for temperature and voltage measurement feature up to 16 single ended (SE)/8 differential (DIFF) analog inputs. Each device includes 8 digital I/O and two counter inputs. The OMB-DAQ-2408-2AO also features two analog outputs. Each device in the series offers 24-bit resolution for ultra-accurate voltage or thermocouple measurements. Ideal for chemical, water, HVAC and R&D in order to measure temperature and process signals in plant or lab environment.